Dr. Sagayama took me to the Rikugien Gardens today (Japanese is the title of the post). It is a pretty popular time to visit the gardens right now because the cherry blossoms are in full bloom. In about a week all the flowers will disappear and the Japanese celebrate this time by having cherry blossom parties. I got several cools pics and learned a lot about the link between Japanese gardens and poetry. I even got to take part in a traditional Japanese tea party. We started out looking at the cherry blossom trees on campus. It's actually really hard to get a good picture since the flowers are so bright. Even the signs in Tokyo tell where to watch the cherry blossoms. The main grove in the park is crowded with people. I had to wait a while to get a good shot. The park reminded me of Central Park in New York. Just beyond the park are skyscrapers. Dr. Sagayama has been really kind and his students have been great to work with. This is called "Sleeping Dragon Rock." Maybe tomorrow the students will eat swords of fire! Finally settled here in Tokyo. Here is my new home away from home. Definitely sparse, but hey, I really just need a laptop with Internet. The people here have been incredibly nice and have been very patient with my terrible impression of someone trying to speak Japanese. Yes, I'm that bad that it would even be bad if I was trying to speak it poorly. It was definetly one of the worst plane rides I've ever had. As soon as we got in the air, we were told that we had to land in Denver because of a medical emergancy. We didn't get back in the air until many hours later. Special tip for anyone: if you feel like you are having problems breathing on the ground, it's not going to be better 5000+ feet in the air. Special thanks to Uchiyama Yuki for staying awake to get me to the hotel. I have tons of work to do here, but it should still be a fun and very rewarding trip. More tomorrow. Ohayoo gozaimasu, konnichiwa, or konbanwa to translate James Randi's standard greeting on his "Randy Speaks" segments. I've been putting off making this announcement because, well, I've been very busy and exciting "of the moment" things needed comment first. I will be traveling to Japan to be a visiting student for a few weeks at Dr. Sagayama's lab at The University of Tokyo. It is a great privilage and honor to achieve this opportunity. One project I am excited about is automatic chord detection, which I have been working on for my thesis. Dr. Sagayama's group did very well in last year's MIREX competition, but my adviser and I have already noted a couple areas for improvement. I am also excited to learn about the many cool things Dr. Sagayama's lab does. During my long stay there, I will be giving a talk on "Acoustic Segment Modeling for Music Information Retrieval" and how semi-supervised and unsupervised training can bridge the missing gap between automatic speech recognition technology and music information technology. I will briefly discribe the importance of separating the contextual and interpretive nature of music from acoustically grounded attributes when training acoustic-based systems. I am finishing up the slides now and will post them after my talk. Anyway, during the next three weeks, you may see some pictures of Japan and Taiwain since I will be going to ICASSP to give another presentation titled "On the Importance of Modeling Temporal Information in Music Tag Annotation." Sayoonara! Malcolm Slaney will be giving a talk in the TSRB building at Georgia Tech on Friday. Unfortunately, I may be out of town since my soon-to-be sister-in-law is getting married the week, but I'm trying to talk my fiancee into going. So if you are in the Atlanta area, check out the talk and give me some notes! "We're drowning in Multimedia. Hurray!!!!" Internet? In this talk I'd like to share with you Yahoo's experiences in this brave new world of multimedia everywhere, describe promising new technologies, and discuss open research directions. I will describe the need for better user and multimedia models, the kinds of algorithms needed for today's large databases, and how the Internet is changing multimedia retrieval. Malcolm Slaney is a principal scientist at Yahoo! Research Laboratory. He received his PhD from Purdue University for his work on computed imaging. He is a coauthor, with A. C. Kak, of the IEEE book "Principles of Computerized Tomographic Imaging." This book was recently republished by SIAM in their "Classics in Applied Mathematics" Series. He is coeditor, with Steven Greenberg, of the book "Computational Models of Auditory Function." Before Yahoo!, Dr. Slaney has worked at Bell Laboratory, Schlumberger Palo Alto Research, Apple Computer, Interval Research and IBM's Almaden Research Center. He is also a (consulting) Professor at Stanford's CCRMA where he organizes and teaches the Hearing Seminar. His research interests include auditory modeling and perception, multimedia analysis and synthesis, compressed-domain processing, music similarity and audio search, and machine learning. For the last several years he has lead the auditory group at the Telluride Neuromorphic Worksho. I have not used this blog to criticize many of the worthless or harmful causes of musical artists, actors, and other celebrities because, well, I would never get any work done. However, I could not resist this. That's right, The Bee-At-els have decided that a worthwhile cause is to teach meditation to stressful children through transcendental meditation with the help of the David Lynch Foundation. On the surface, this seems harmless enough. How can one be against teaching stressed-out kids a way to relax? The problem is that transcendental meditation (TM) is pure pseudo-scientific nonsense. I want to distinguish it against the regular idea of meditation, which is basically a "deep" form of relaxation. Transcendental meditation is supposedly hundreds of years old, but there is little evidence to support this. It was "introduced" to the Western world about 50 years ago by Maharishi Mahesh Yogi. It has spawned many ridiculous and unfounded claims such as levitation and The Maharishi Effect, where it said that if just 1% of a population is practicing TM, then crops will improve, the area will become a haven from crime, and automobile accidents will decrease to abnormally low levels. Further, this effect is supposed to be scientifically proven. 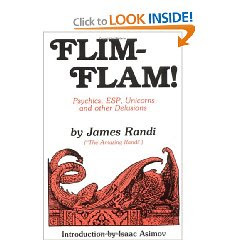 However, all of these claims have been debunked by James Randi in his book, Flim-Flam! Further, the evidence of this effect comes from the most dubious of source - The Maharishi International University and these claims have been further disproven or found to be poor science. My favorite example in the link is the study that did not have a control group because "not one person was willing to be part of the control group." The whole point of the control group is to account for the placebo effect where people will believe they are better just because they feel they have gotten treatment. Simply put, TM reduces stress as much as any other relaxing activity and is by no means special. Again, I have no problem with teaching children ways to cope with stress, but let's be honest, that's not what the David Lynch foundation is really doing. The reality is that they are using the "think of the children" argument to indoctrinate children into an illogical belief and promoting bad science. If it's stress reduction they are after, then they should be open to any types - sports, reading, talking, going for a walk, etc. My problem with this is the same as if Creed taught religion and prayer behind the disguise that this would prevent kids from hanging out on the streets and developing drug habits. It might, but so would an afterschool basketball league. Note: Creed is an example since they are the most famous religious group I can think of. As far as I know, their humanitarian efforts are as successful and spirited as their music. Malcolm Slaney is to give an overview talk on "Music Retrieval at the Scale of the Internet". Meinard Mueller is hosting a tutorial on "Analysis and Retrieval Techniques for Music and Motion Data"
This technical symposium should give the conference a neat side story.